If you have questions on MEAN WELL’s products, please read the FAQ first. If the listed answers still cannot solve your problems, please contact our local distributors , they should reply to you as soon as received your request. 4. Make sure that the model qualifies for the safety standards and EMC regulations you need. There are some minimum-load requirements on MEAN WELL's multi-output power supplies. Please read the specification first before connecting to the load. In order to allow the power supply to work properly, a minimum load for each output is required, or else, the output voltage level will be unstable or outer tolerance range. Please refer to “Current range” in the specification as shown in the table below: Channel 1 requires a 2A minimum-load; channel 2 requires 0.5A; Channel 3 requires 0.1A ; Channel 4 does not need any minimum-load. What is MTBF? Is it distinct from Life Cycle? What is DMTBF? DMTBF(Demonstration Mean Time Between Failure) is a way of evaluate MTBF。Please refer to the following equation for MTBF calculation. AF：Acceleration factor, which can be derived from acceleration factor equation. T2：The temperature that is used in the meaning of acceleration, and the chosen temperature could not result in physical change in materials. Note: Kelvin will be the unit use for calculation. It is the small unwanted residual periodic variation of the direct current (DC) output of a power supply which has been derived from an alternating current (AC) source. The wave form is shown as figure below. There are two AC contents, also known as Ripple and Noise (R&N), on the DC output. The first one, coming from sine wave rectification, is at a low frequency which is 2 times of the input frequency; the second one is at high frequency which is from the switching frequency. For measuring high frequency noise, configurations of an oscilloscope with a bandwidth of 20MHz, a scope probe with shortest ground wire possible, and add 0.1uF and 47uF capacitors in parallel with test point for filtering out noise interference are requires to be made. Hi-Pot Test is a way to ensure if the isolation between primary to secondary is done properly, preventing damaging to S.P.S. when facing high voltage between input and output. The test voltage should be gradually increased from 0V to preset level and remains at preset level for 60 seconds with raise time greater than 1 second. In mass production, the test period could be reduced to 1 second. If the leakage current flowing through the isolation material increases rapidly when applying test voltage, it indicates ineffectiveness of isolation (dielectricbreakdown). Corona effect/discharge or transient electrical arc is not considered as failure. When AC test voltage is applied, Y capacitors are the main cause of leakage current. A 4.7nF capacitor can cause leakage current of 5mA. According to regulations of UL-554, the Y capacitors should be removed for Hi-Pot test, which is not practical for mass production. The only solution is to increase the leakage current setting, typically 25mA, of test instrument. Presently, the criteria of leakage current are not defined in safety regulations. According to regulations of IEC60950-1, DC test voltage can be substituted when there are bridging capacitors coupled between primary and econdary circuits, so as to solve the problem of leakage current. What is the definition of IP (Ingress Protection) ratings? And what is MeanWell’s IP68 definition. 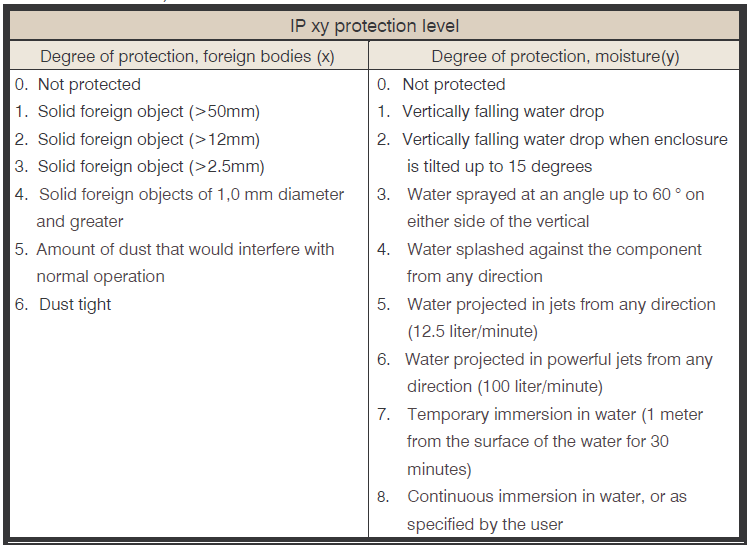 *IP64-IP66 level products are suitable for damp indoor or sheltered outdoor environment. For actual installation limitations, please refer to ther corresponding IP level tests. *All products cannot be continuously submerged in water. *The definition of IP68 by MEAN WELL: Immerse a unit under test in 1 meter below the surface of the water, tested with a dynamic condition where 12 hour AC on; 12 hour AC off. How do you select suitable MW LED power supply? Select suitable wattage based on customer’s system requirements and application methods. Must also take excess power and driving method into consideration. For selection key points when using MW power supply to “directly” drive LED lamp refer to questions (A2) and (A3). For selection key points when using MW power supply in combination with LED driver IC to achieve high precision current control refer to questions (A2) and (A3). Based on LED power supply’s operating environment select suitable IP level and mechanical type (metal enclosure, plastic enclosure, and open frame PCB) for that environment. Is PFC function required or not? Single stage PFC is only suitable for LED load. 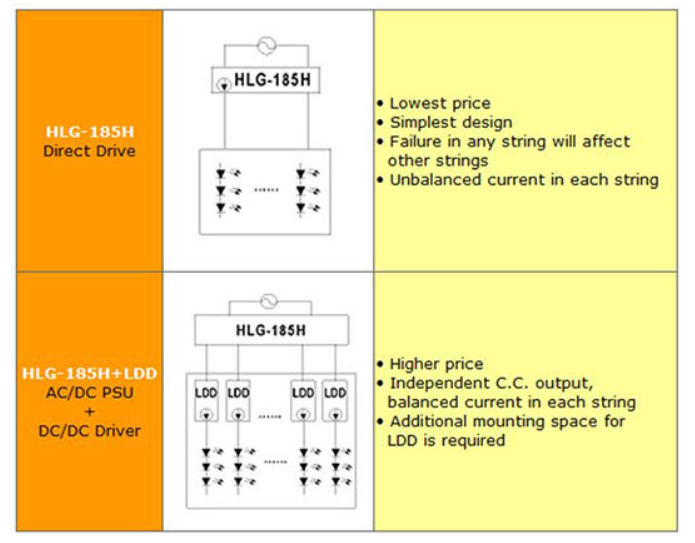 Dual stage PFC is suitable for general applications. If LED system is based on direct drive, units with adjustable voltage and current should be considered for flexibility in changing voltage/current levels. Dimming function may also come in handy when LED brightness control is preferred. *For those who chose to use single stage PFC products. Refer to Question D1for more instructions. 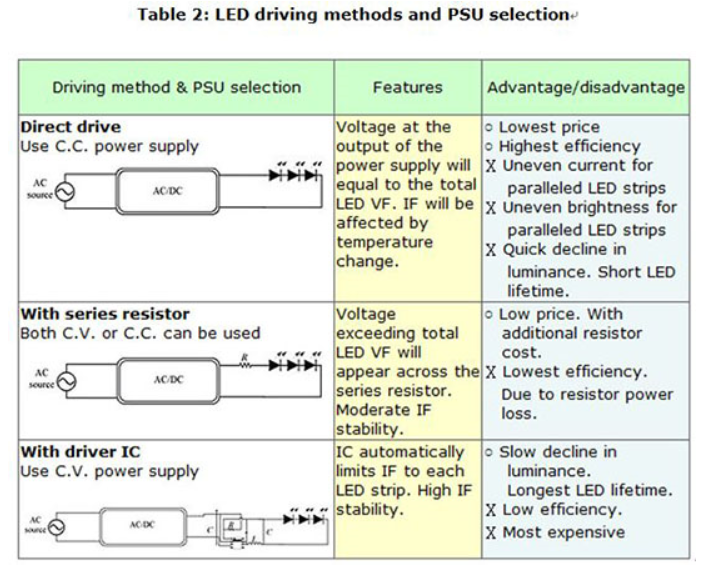 What are the most common LED driving methods? What are its advantages and disadvantages? What to consider when selecting LED power supply? For models with active PFC and system PF requirement is >0.9, load usage must be higher than as specified in the PFC spec. Relationship between PF and output load can be found in figure 1. The typical requirement is 75% load or above. Double check the spec for the model you are using to confirm actual requirement. In areas with unstable AC voltage such as heavy industrial zone or generator supply utility, please select general usage LED series from table 1. The start up voltage of driver IC should be as close to the power supply rated voltage as possible. Driver IC needs stable voltage to function properly. So, it is highly recommended to use general usage series from table 1. For models with active PFC and system PF requirement is >0.9, load usage must be higher than as specified in the PFC spec. Relationship between PF and output load can be found in figure 1. The typical requirement is 75% load or above. Double check the spec for the model you are using to confirm actual requirement. When using driver IC, possible system EMI issue could arise. After completing lighting system design, EMI must be double checked. For suggestion on system EMI problem solving, refer to question 11. 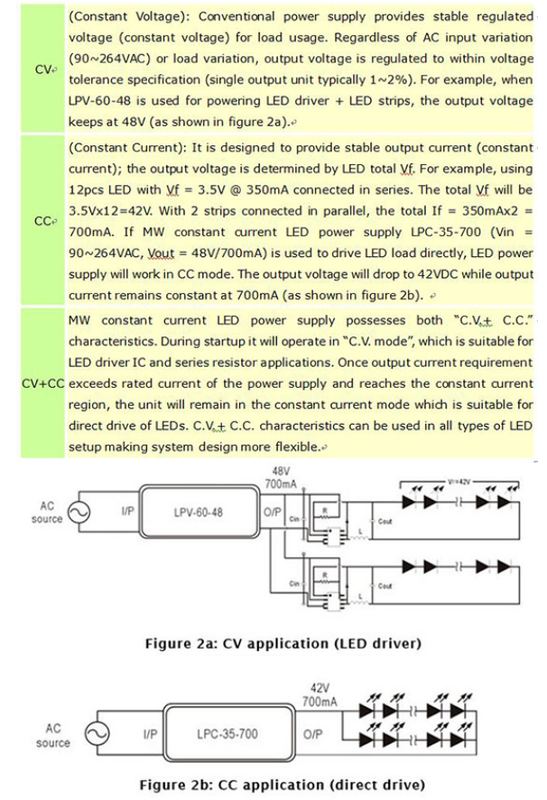 What are CV, CC, and CV+CC which are often mentioned in LED power supply specification? How to use ELN-30/60-XXD(P) Dimming function in applications? 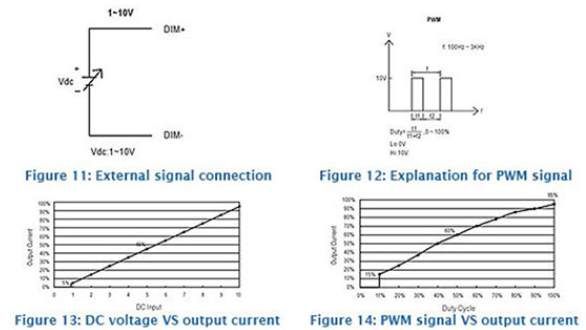 As shown in fig 11&12, an external signal can be applied to “DIM+” and “DIM-.” The signal can be either DC voltage (D Type) or PWM (P Type). 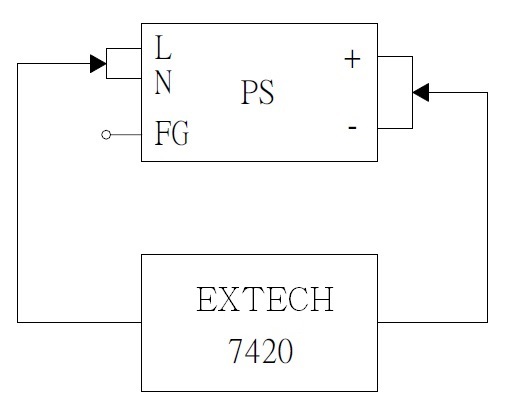 By changing the signal levels as shown below, the output current limit can be controlled by the user. Please note, the relationship between external signal and output current level is non-linear. It cannot be used for high precision dimming control. Does MW LED power supply allow adjustment of output voltage and current levels? LED power supply comparison table to see which MW LED power supply allows for V/I adjustments. A suitable unit can be picked based on the type of adjustment required. For the allowed adjustment range, please refer to the spec sheet. Tuning of the voltage and current levels can be done through the built-in VRs/potentiometers. PLN/ELN requires removal of the top cover in order to access the internal SVR1 and SVR2, see figure 9 for VR locations. For other series, the VRs can be accessed through IoADJ and VoADJ holes after rubber stopper removal. After adjustments have been made, please make sure rate power is not exceeded and the rubber stoppers are properly reassembled. What does the IP level found on MW LED power supply mean (i.e. CLG-100 = IP67)? To design a LED street lamp, what solution can MEAN WELL offer? What is the main difference between 1~10V dimming and 0~10V dimming regarding applications? With 1~10V dimming, the lighting unit can be dimmed down to 10%; with 0~10V dimming, it can be dim down to 0%, or say, dim to “off”. What is the current accuracy of LED SPS? For LED SPS output current accuracy, please refer to product specification. For CC model, “CURRENT ACCURACY” is listed in SPECIFICATION section. For CC+CV model, please reference the OVER CURRENT range in PROTECTION of the SPECIFICATION section. What is the difference between Single Stage and Two Stage Power Supply? There are 2 types of Power Factor Correction circuits; one is Single Stage and the other is Two Stage. Single stage power supply combines functions of power factor correction and converter in one circuit but two stage use two separate circuits. Compared to Single Stage, Two Stage design is more complex and costly but the immunity performance of Two Stage PSU against AC mains is much better than that of Single Stage PSU; in addition, Two Stage manifests better ripple noises performance on output. Owing to that Single Stage is only suitable for fields with quality AC mains but Two Stage can be used in serious circumstance for LED drivers or as industrial switching power supplies. How am I supposed to read the LED V-I dotted line & tolerance definition in the specification? Mean Well’s LED product specification normally exhibits V-I characteristics. Per the characteristics, there are generally two types of drivers, “CC” type and “CC+CV” type. “CC” type of driver is suitable only for LED applications whereas “CC+CV” for either LED applications or general switching power supply applications. 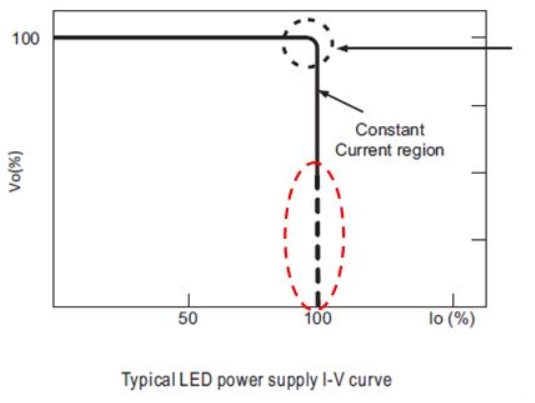 The section that is not suitable for LED applications are represented by dotted line, and based on the protection procedures it can be categorized into hiccup mode and constant current mode; in this section, the tolerance of current is not defined but only the characteristic of current is displayed. If customers attempt not to see a very high current under short circuit condition, those models with hiccup mode for this section can be selected; if there are applications with motors or capacitive load, those with constant current can be chosen.